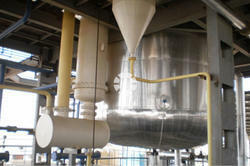 We are a leading Manufacturer of re-refining plant from Pune, India. Re-Refining Plant by Batch Vacuum Distillation: We offer Batch Distillation technology to our valuable customers. This technique is widely used for the process of highly effective recycling and refining of various used lubricating oil in various small scale plants with small recycling and refining capacities. The distilled product, which is precisely obtained from this batch distillation process, can be refined into different viscosities of base oil. Different methods that can be used for the purpose of refining the distilled products are solvent extraction, regenerative clay process and clay treatment methods. Looking for Re-Refining Plant by Batch Vacuum Distillation ?